My coworker made the most amazing sugar detox meal! I’m pretty excited to share this genius idea of hers. Over the weekend, she went out to Cheesecake Factory and really wanted to try the shepherd’s pie, but decided to make her own healthy version at home. Here’s the result! 1. For the cauliflower mash: steam cauliflower florets until tender. Mash them with 1/4 cup of cream and butter to taste. Add a bit of shredded mozzarella and one egg to get the mixture to bind. Season with a bit of garlic. 2. For the base: brown 1 lb of ground turkey in a pan. Season with salt, pepper, and oregano. In a separate pan, sauté shredded carrots, shredded green beans, shredded onions, and shredded tomatoes. All this shredding can be done in a food processor! 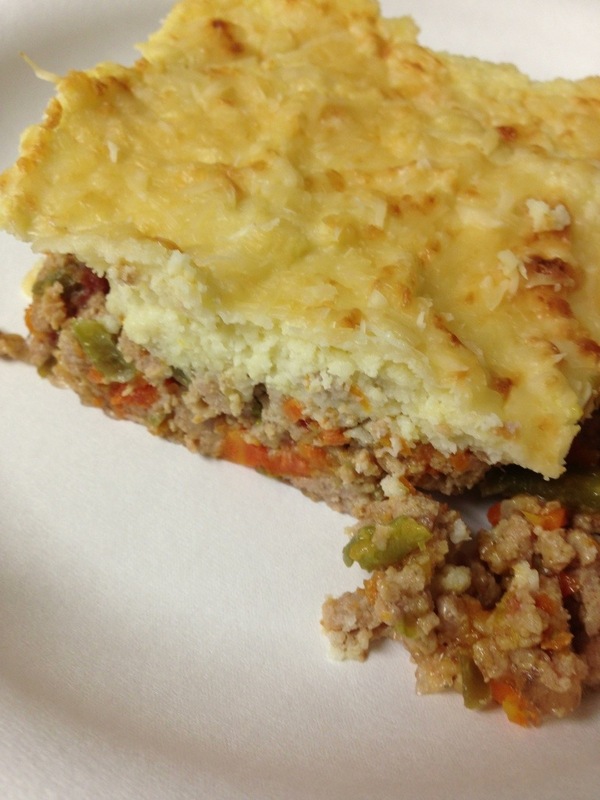 Combine the turkey and veggies in a casserole dish. 3. Top the meat and veggie mixture with cauliflower mash and sprinkle with parmesan cheese. Bake at 375 degrees for 30 minutes. Broil to get the cheese golden and bubbly for the final 2-3 minutes. Can’t wait to make this! It’s so satisfying and you won’t even miss the potatoes.